Ever wished you could directly sell your products and services from within Facebook? If so, this post is for you. I decided to dig in and research the current landscape thoroughly, both to better understand the lay of the land and to save you the research hassle. 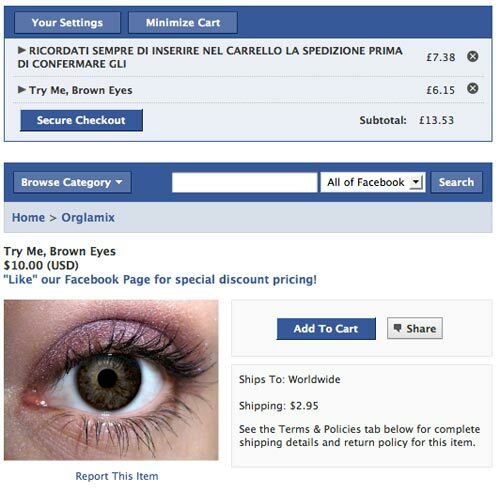 It was only a matter of time before Facebook and e-commerce would converge. Until a little over a year ago, only storefronts existed on Facebook, where merchants could display and promote their products and, with “Add to cart” buttons, imply e-commerce functionality. But when users clicked on “Add to cart, they were whisked away from Facebook to the merchant’s website where the actual shopping-cart experience occurred. Two prominent examples of storefront-only functionality on Facebook are Threadless and Best Buy, both of which include great integration with Facebook’s social features (sharing, commenting, liking), but don’t support e-commerce transactions within Facebook. Best Buy’s storefront is powered by BigCommerce’s “SocialShop” application, which allows merchants to display products on their Facebook page and offers the user many options for viewing products and information. Although it appears so, the user can't actually buy on the Best Buy Facebook page. 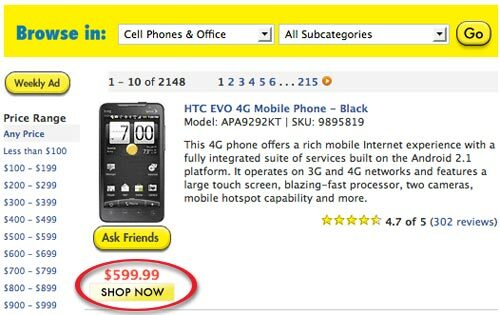 Clicking the "Shop Now" button takes you to Best Buy's e-commerce website, also powered by BigCommerce. Similarly, on the Threadless page, clicking on "Add to cart" takes you to their website where the actual e-commerce begins. ShopTab costs $10 - $20 per month, depending on the number of products. 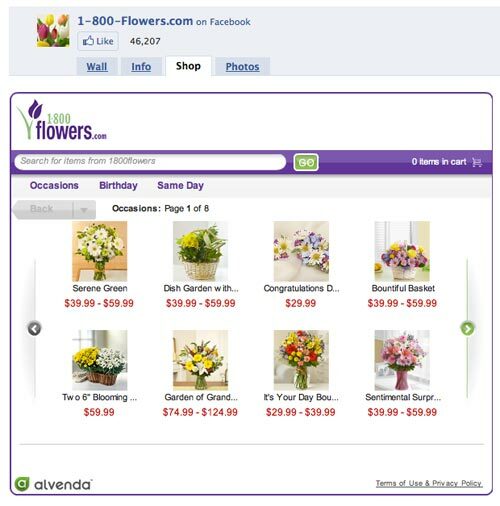 On July 8, 2009, the first complete e-commerce experience appeared on Facebook when 1-800-Flowers premiered its Facebook store, powered by Alvenda. For the first time, users could conduct an entire sales transaction without ever leaving the Facebook environment. 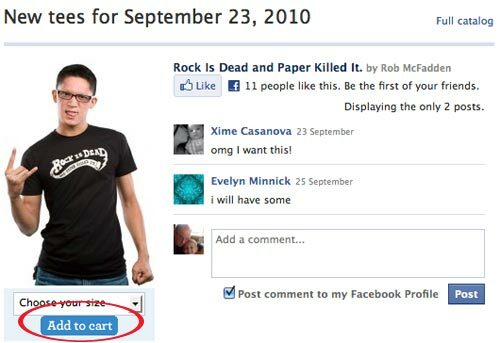 Although not a fully integrated Facebook experience, the Alvenda approach heralded the arrival of real shopping on Facebook. It’s been only a little over a year since the 1-800-Flowers Facebook shop appeared and still there aren’t a lot of choices for applications that allow the entire shopping experience to occur on Facebook. But we can certainly expect more and better applications to come online in the coming months and years. Here are the ones I think are the current best in show. If anyone feels I’ve missed one, feel free to use the comments to let me know. Alvenda utilizes Adobe Flash to create its functionality for its many customers which include 1-800-Flowers, Delta Airlines and Brooks Brothers. The Flash “widget” is actually located on a non-Facebook server and is pulled into the Facebook “chrome” via a custom Facebook iFrame application. On the 1-800-Flowers page, when the visitor clicks on the “Shop” tab, a graphic is presented that introduces the visitor to the “Facebook Shoplet” and encourages her to “click right in” to start shopping. Upon clicking the “Start shopping” button, the visitor is taken to 1-800-Flowers’ Alvenda-powered Facebook application where the e-commerce begins. The remainder of the e-commerce transaction occurs on this application page. Another groundbreaking Facebook e-commerce event was Alvenda’s development of “Ticket Window,” Delta Airlines’ Facebook-based ticketing system, which premiered in August 2010. Unlike the 1-800-Flowers Facebook application, the Delta Ticket Window keeps the user on the page's "Book a Trip" tab. This was the first Facebook-based airline ticketing system, and it's pretty cool. Although we have to give Alvenda and 1-800-Flowers kudos for getting there first, there is one drawback to the Alvenda experience: The entire e-commerce widget — which is contained in the iFrame — is built in Flash. This means that the many millions of users accessing the site via their iPhones, iTouches or iPads won’t be able to use the shopping feature, as Apple does not allow Flash to run on its mobile and tablet devices. As more of these Apple products are sold, and they are selling like hotcakes, this will increasingly be a drawback to using Alvenda. However, in order to compensate for this, I’m certain many merchants (Alvenda’s customers tend to be larger enterprises) plan to develop applications for these devices (1-800-Flowers already has). Alvenda is a commercial product and they don’t provide costs on their website, so it’s probably not cheap. Fortunately for many small businesses, there are a couple of Facebook applications available that are free, fully integrated into the Facebook experience, and don’t rely on Flash. Overall, I consider these applications the better option for smaller merchants who still wish to sell their products and services on Facebook, fully integrate with Facebook’s social features and not have to rely on developing special applications to reach the millions of people using Apple devices. In terms of real integration with Facebook, as well as cost (it’s free) and technology (it’s not a Flash application), Payvment is the one to beat. It is considered the leading shopping platform inside Facebook. Payvment utilizes PayPal’s “Adaptive Payments” API to provide what I think is the most fully integrated Facebook shopping experience to date. Payvment’s feature set is pretty amazing, including full integration with Facebook and a seamless Facebook experience, product search, Facebook-wide shopping cart system (their “Open Cart Network” technology) that enables customers to complete their purchase from any storefront on Facebook, ability to customize with HTML, and TRUSTe privacy. This is pretty amazing — Payvment transforms Facebook into a gigantic department store where users can keep their purchases with them across thousands of Payvment-powered storefronts on Facebook and do the checkout at any point. Payvment also features support for FedEx and UPS automatic shipping calculations, as well as the ability for retailers to provide instant discounts and coupons to users who “Like” their page. Also, and importantly, once you have simply added the Payvment application to your page, you can add and manage your products right within the application. I checked out a few Facebook pages that are using Payvment, including Adult Swim UK, Grayce by Molly Sims (Jewelry) and Orglamix Cosmetics. As you can see, the payment interface definitely has the Facebook look and feel, and the entire experience feels and is very Facebook-centric. Payvment is just coming up on its one-year anniversary (it launched in October 2009), and I’d say it has the edge at this point, particularly with merchants with budgets smaller than companies like 1-800-Flowers or Delta Airlines! Top K2 and My Vanity Shoes are good examples of how BeeShopy looks and functions. As I mentioned at the top, please share any applications that you think also deserve mention in this new space. What do you think? Have you used Facebook to sell your products? If so, leave your thoughts and comments in the box below.